Abstract: Chebyshev polynomials show remarkable properties in different parts of mathematics. In the theory of finite fields, a polynomial is called exceptional if it induces a permutation over infinitely many residue fields. The classification of exceptional polynomials is finished; if a polynomial is exceptional then it is a composition of linear polynomials, monomials and Chebyshev polynomials. Lidl and Wells have generalized Chebyshev polynomials to several variables and shown that these multivariate maps induce permutations over infinitely many finite fields. One can show that their multivariate polynomials correspond to a family of maps associated with Lie algebras A_n. 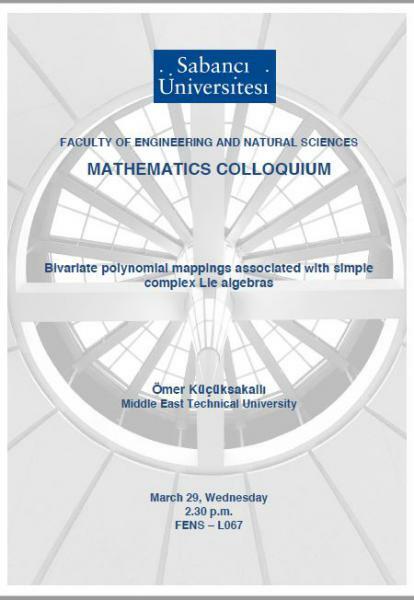 In this talk, we will focus on the bivariate polynomial maps associated with the rank-2 simple complex Lie algebras B2 and G2. We will give criteria when these bivariate maps induce a permutation over a finite field. Using these criteria, we will disprove a conjecture of Lidl and Wells.